In this installment of FAQ, SQE Trainer Linda Hayes answers one of the questions students ask her most often. Hello, Better Software Magazine Reader! 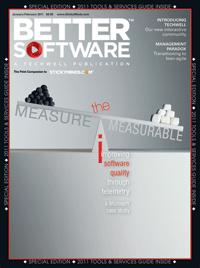 A letter from the Better Software magazine editor—Editor in chief Heather Shanholtzer has graciously offered me the opportunity to write the editor's note for this issue of Better Software magazine as an opportunity to tell you about a project we've been working on for a while. We at Software Quality Engineering are quite fond of the content, contributors, and community at StickyMinds.com, but we recognize that even the finest houses eventually will need at least a fresh coat of paint. When joining a project, your position isn't a given; you must negotiate it. Lee identifies five roles that combine to make up team relationships. Whether you are involved in a traditional V-model environment or applying agile development methodologies, setting testing priorities is always an issue. From practical experience in various domains (e.g., embedded, medical, automotive, banking, and logistics), Erik shares ten essential lessons learned regarding risk-based testing. The transition to lean-agile can be challenging for traditional project managers because traditional competencies and practices can conflict with the core principles that explain why lean principles work. To help prepare project managers transitioning to lean-agile, this article exposes five counterintuitive practices that challenge standard project management beliefs. In today's software development and test environment, we seem to have little time for either problem identification or solution implementation. What seems to work well instead (and is more fun) is to try small experiments. The idea is not to solve problems, but to try to learn in little steps.